A virtually indestructible place to keep your working puzzle. This storage system has four wooden reinforced sliding drawers to sort and hold your pieces and a smooth fiberboard work surface. 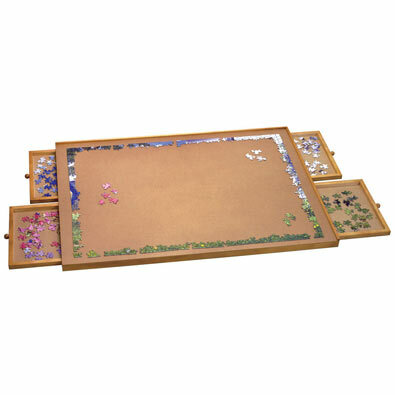 Designed with two edges that are flush with the surface to easily slide your puzzle off for gluing and framing. Sealed with lacquer finish to prevent warping. Use it again and again for all of your puzzles in progress. Wood tones may vary. • Standard Wooden Puzzle Plateau measures 20-1/2" x 28-1/2"
*Sorry, express shipping and gift wrapping is not available for Standard Wooden Puzzle Plateau.